145cm Black, Welsh Section D gelding 7years old, stunning looks and movement. He has been professionally schooled through the winter with Chris Ainscough and is snaffle mouthed, has a good, natural head carriage with a flexible working trot. He has a forward going attitude and is willing to please. We have taken him to compete at a couple of outdoor events at Chester club last season, where he was going through water and through all obstacles positively. He has also done some indoor events at Reaseheath. 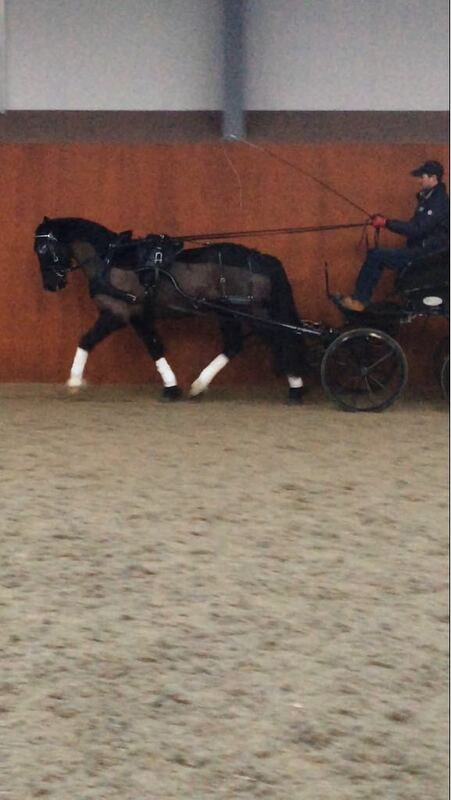 He has now started cantering in the carriage and is a prospect for National Novice/intermediate this year. He has also been broken to ride and has a kind temperament both in and out of the stable, good to shoe, box and catch. He is fairly fit and should only need a few weeks preparation for the new season. Open to vet. Only for sale as I am concentrating on my other pony this season.